Dates have quickly risen to staple status in our house. They may seem a surprising choice, but considering their nutrition, convenience and enjoyable taste, they make a great, kid-friendly snack. 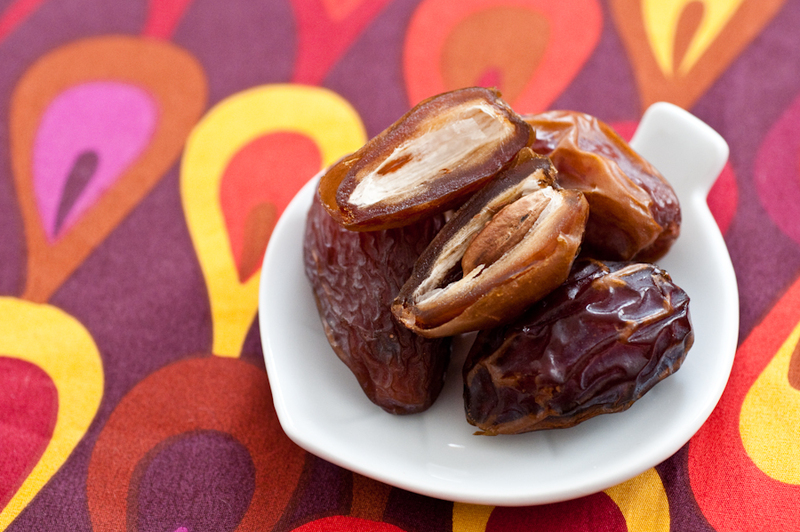 Naturally sweet dates are sometimes known more for their filling than as a stand alone fruit. They are pitted and stuffed with nuts, smothered in peanut butter, or rolled in coconut. Those additions certainly make for a tasty treat, but dates are excellent on their own and added into other dishes. Medjool dates are the front runner for our family. They are often the second fruit at breakfast – after a banana, kiwi or whatever the main fruit of the morning may be, or an addition to a packable snack mix, along with raisins, whole grain oat cereal, and other dried fruit. Dates also serve as a dessert type snack in the evening, and may be accompanied by animal or graham crackers. Do your kids eat dates? How do you or your kids enjoy them? Do you have a favorite recipe – dessert or otherwise – using dates? I believe that dates are healthy, I do find them to be quite sweet though. I ADORE dates! I have a bunch of recipes (ranging from salads to appetizers to desserts) on my blog featuring the naturally sweet fruit, and always keep a container of the Medjool variety on hand. Neil, I agree about the sweetness, which I’m sure is why my kids enjoy them so much! Lauren, I just viewed some of your recipes, and they look excellent! Thanks for sharing your great site.